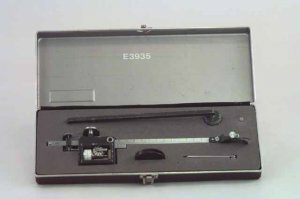 This Pole (or polar) Planimeter is able to mechanically measure the area of plane figures. The pole weight is placed on the desk. The pole arm connects the pole weight to the carriage while the tracer point is connected to the carriage by the tracer arm. This causes the carriage to move on a circular path, regardless of the shape the tracer point follows. 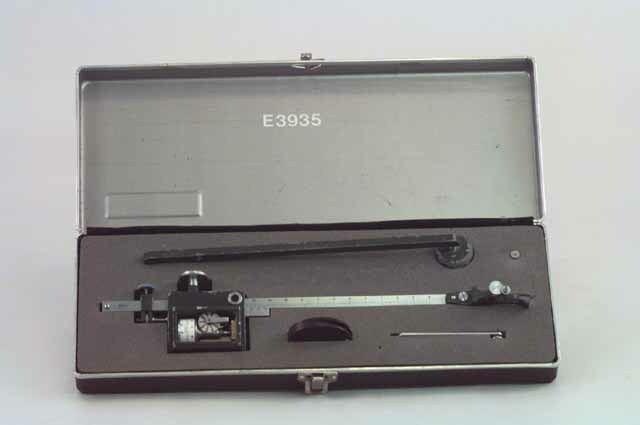 The area of the figure is measured by tracing the outline of the figure with the tracer arm, and is determined by how much the measurement wheel rotated. can be easily optimized for either measuring range or resolution by adjusting the adjustment screw. measuring wheel carriage with arbitrary scale. push button to zero the measuring mechanism. checking ruler (made of stainless stell) marked: 10 sq. extra pin for the pole weight. Comes in a metal case covered by black vinyl and lock, packed in a protecting foam.